Meet Mariann and find out about her role at Manchester Airport. 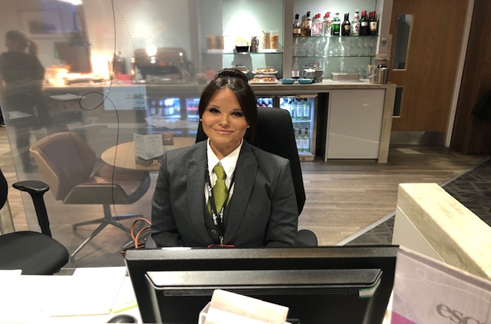 My name is Mariann, I’ve worked at the Escape Lounge in Terminal 2 at Manchester Airport since returning back to work from maternity leave. I have worked in the aviation and travel industry for almost fifteen years, mainly as Cabin Crew for various UK and European airlines and also in passenger services and travel sales on the ground. What is it like to work at MAG? It’s a genuinely lovely environment to work in, all the colleagues around the airport are really welcoming whether it’s bumping into anyone at security or having a chat with the airline reps or colleagues from another lounge- everyone works together and gets on well, there’s always a friendly face nearby! The role is varied which is great, as no day is the same. On any given shift I could be hosting at the Escape Lounge bar or taking care of our business-class guests in our Escape Plus Lounge. I also have the opportunity to welcome guests into our main Lounge on the reception desk and with our Meet and Greet service. What’s your biggest challenge as a Lounge Host? The only main challenge I’ve encountered so far is that quite often, the lounges can be very busy at certain times of the day because of their ever-growing popularity so having to multi task and manage my time correctly as well as learning the job role at the same time when we have a huge amount of guests using the lounge can be a little tough but I’ve been able to learn quickly! What attracted you to become an employee at MAG? Manchester Airport has been long renowned for being a secure and successful employer and there are a huge range of benefits for employees working for MAG such as an excellent pension scheme, bonus schemes and yearly pay rises, retail discounts, discounted Lounge access and free holiday staff parking for colleagues. I hugely enjoy interacting with our guests and finding out where they’re travelling to and quite often, they have interesting stories to tell or travel tips to share with me! See a video of Escape Lounge Terminal 1 here.